Barbara Eden is a consummate entertainer. Her career spans six decades and, according to her official website, she "has starred in 25 feature films, five network TV series, 19 top-rated network made-for-television movies and headlined at many of the major hotel resorts and casinos including Lake Tahoe, Atlantic City and Las Vegas. She also was the star attraction at the MGM Grand, Caesar’s Palace and Harrah’s, as well as on concert stages and in legitimate theaters across the country." Barbara was born Barbara Jean Morehead in Tucson, Arizona. The year of her birth was thought to be 1934, but an Arizona birth certificate states that she was born on August 23, 1931. Barbara is the daughter of Alice Mary (née Franklin) and Hubert Henry Morehead, a butcher. When Barbara's parents divorced, she and her mother moved to San Francisco, California. Her mother then married Harrison Connor Huffman and Barbara took her stepfather's name. Huffman, a hard-working telephone lineman, struggled to make ends meet during The Depression. In 1949, Barbara graduated from Abraham Lincoln High School in San Francisco. As a teenager, she sang in the church choir and with bands at nightclubs. She studied vocals at the San Francisco Conservatory of Music and went on to study theatre for a year at City College of San Francisco. 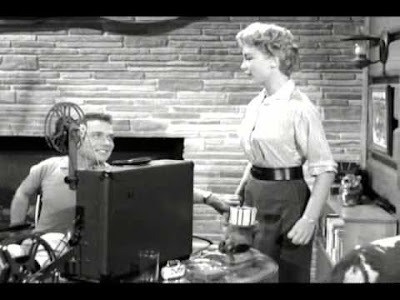 One of Barbara Eden's earliest television appearances was on The Johnny Carson Show in 1955, with Rudy Vallee as Johnny's guest star. She was billed as Barbara Huffman then. According to her memoir, Jeannie Out of the Bottle, Barbara's first agent, Wilt Melnick, requested that she change her name before he represented her. He said that "Barbara Huffman" sounded like a doctor. Barbara replied that he could give her any last name he liked, provided she could keep her first name. Melnick chose "Eden" because he thought she seemed "kind of innocent" like the garden. As her career began to flourish, Barbara was featured in episodes of such TV series as I Love Lucy (1957), Perry Mason (1957), Bachelor Father (1957), Gunsmoke (1957), December Bride (1957), Father Knows Best (1958), The Andy Griffith Show (1962), Dr. Kildare (1963) and Route 66 (1964). The I Love Lucy episode is called "Country Club Dance" (Season 6, Episode 25, Air Date: April 22, 1957). 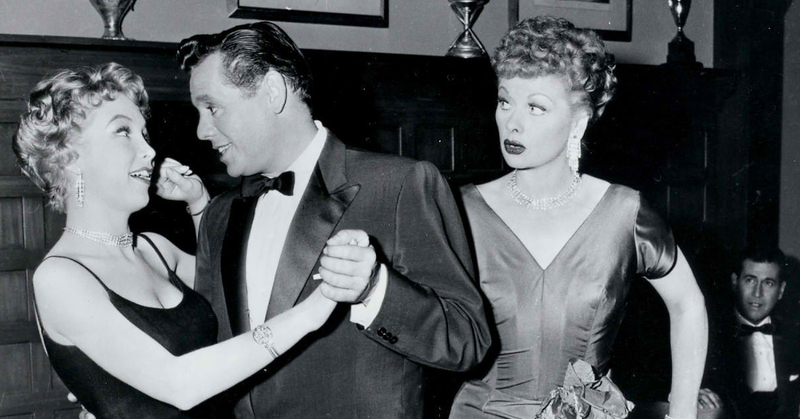 It aired during the final season of the series when Lucy and Ricky Ricardo had moved from New York City to a country home in bucolic Westport, Connecticut. In the episode, the Ricardos and the Mertzes go to country club dance with their neighbours, Ralph and Betty Ramsey. At the event, an attractive visitor named Diana Jordan (Barbara) catches the eye of many of the men, including Ricky and Fred. They are all eager to dance with her, much to the annoyance of Lucy and her friend Ethel, who become terribly upset and jealous. The Perry Mason episode is entitled "The Case of the Angry Mouner" (Season 1, Episode 7, Air Date: November 2, 1957). Barbara played Carla Adrian, the daughter of a woman charged with murder. From 1957 to 1959, Barbara starred as Loco Jones on the television show How to Marry a Marry a Millionaire. 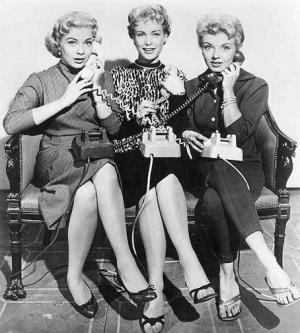 The series was based on the 1953 film of the same name, starring Marilyn Monroe, Lauren Bacall and Betty Grable. Barbara's co-stars in the TV version were Mary Anders and Lorie Nelson. In the second season, Lorie Nelson's character was written out and she was replaced by a new character played by Lisa Gaye. In 1964, Bewitched, a series about a witch (Elizabeth Montgomery) married to a mortal. It was one of the mos popular sitcoms on American television. In 1965, producer Sidney Sheldon hoped to emulate the success of Bewitched with his own fantasy series about a genie. This time, the genie would be a woman, not the proverbial hefty male in a turban. Various actresses tried out for the role, but Sheldon signed Barbara, whom he had seen in The Brass Bottle, a 1964 film about a genie in a bottle. 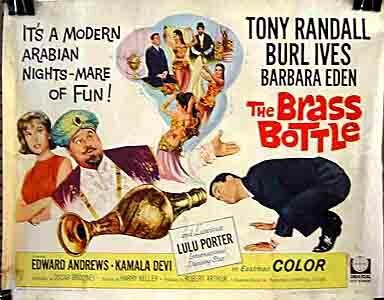 The movie also starred Tony Randall and Burl Ives, with Ives as the genie and Randall as the master. 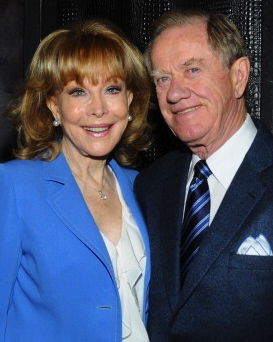 Barbara, played the Tony Randall character's girlfriend. I Dream of Jeannie aired on the NBC network from 1965 until 1970. It ran for five seasons and 139 episodes of the series were produced. Barbara played a 2,000 year old genie and Larry Hagman portrayed her "master," NASA astronaut Major Anthony "Tony" Nelson. The storyline was set in motion when Major Nelson discovered an ornate pink bottle on a desert island after splashing down into the ocean. The bottle, of course, held a beautiful blonde genie and Nelson brought her to his home in Cocoa Beach, Florida. Bill Daily played Major Roger Healey, Tony Nelson's best friend. Daily, now 89 years old, went on to play airline navigator Howard Borden, on The Bob Newhart Show. In 1971, a year after I Dream of Jeannie went off the air, Barbara and Larry teamed up again for a television movie called A Howling in the Woods. The suspense thriller was based on a novel by Velda Johnston. It aired as an NBC Premiere Movie on November 5, 1971 and the cast also included Vera Miles and John Rubenstein. Barbara played Liza Crocker, a disillusioned New York housewife with intentions to divorce her husband Eddie (Larry Hagman). She returns to her family home in Stainesville, Nevada to visit her stepmother (Miles) and learns that she has a new step-brother (Rubenstein). The behaviour of the townspeople is mysterious and there is howling in the woods at night. In November of 2012, when Larry Hagman died of complications from cancer, Barbara said of their time on I Dream of Jeannie, "I can still remember that first day on Zuma Beach with him, in the frigid cold. From that day, for five more years, Larry was the centre of so many fun, wild, shocking . . . and in retrospect, memorable moments that will remain in my heart forever." From 1981 to 1982, Barbara starred as Stella Johnson in the NBC sitcom Harper Valley P.T.A. The television series was based on a 1978 film of the same name. The film also featured Barbara as a single mother raising her daughter, Dee (Jenn Thompson), in the fictional town of Harper Valley, Ohio. It was inspired by a popular 1968 country song recorded by Jeannie C. Riley. In 1985, Barbara starred in a two-hour television NBC update of I Dream of Jeannie called I Dream of Jeannie . . . 15 Years Later. Bill Daily reprised his role as Roger Healey, but Wayne Rogers replaced Larry Hagman in the role of Major Tony Nelson. There were reports that Hagman, who had become a huge star as J.R. Ewing on Dallas, was only willing to return for a cameo. Another big change from the original series was that Jeannie's navel could be shown, unlike in the more modest 1960s. From 1989 to 1990, Barbara Eden had the lead female role in A Brand New Life, a comedy series about Roger Gibbons (Don Murray), a millionaire father of three who marries a waitress named Barbara McCray (Eden) with three children of her own. The show was short-lived and only lasted one season. In 2002 and 2003, she played Great Aunt Irma on Sabrina, the Teenage Witch. Barbara has been married three times and divorced twice. 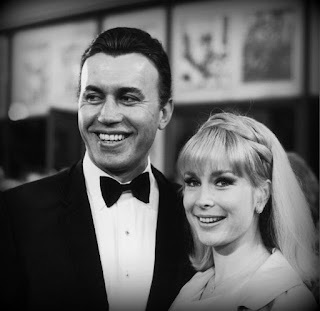 She wed her first husband, Michael Ansara, a Syrian-born American actor, on January 17, 1958. They had a son, Matthew Michael Ansara, born in on August 29, 1965 in Los Angeles. Matthew was an actor and bodybuilder. On June 25, 2001, he was found dead of a heroin overdose. 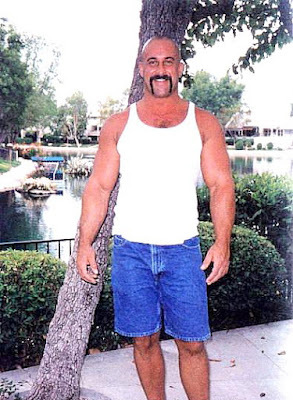 His body was discovered in his pickup truck, outside of a gas station in suburban L.A. He was 35 years old at the time of his death. Barbara told ABC News that, "Apparently he had taken a hit of heroin and he hadn't had it in quite a while, I guess," "It killed him," she said. "It stopped his heart." Barbara Eden and Michael Ansara divorced in 1974. Michael died on July 31, 2013 at his home in Calabasas, California of complications from Alzheimer's Disease. He was 91 years old. In 1977, four years after her divorce from Ansara, Barbara moved to Chicago and wed Charles Fegert, then an executive with the Chicago Sun-Times. The marriage took place on September 3rd of that year. Although Barbara had planned to bring her son with her to the Windy City. Matthew, chose to remain in Los Angeles with his father, who, according to Barbara, threatened to sue for custody. Barbara and Fegert divorced in 1982. Of her relationship with him, Barbara told People magazine that they lived in different worlds that were "tough to reconcile." She stated that she "should have known it would be difficult for a man in business to have a wife who's in the limelight." After her split with Fegert, Barbara returned to Los Angeles, only to find Matthew moody and withdrawn. She didn't realize until later that her son had been using drugs and that he was fighting addiction. When she learned the truth, she and his father sent him to rehab repeatedly. They finally resorted to tough love and Barbara asked him to leave her home. There was a long, dark period when he was on the streets. By the time he was 31, however, he had cut down on his drug use. He then became an ardent bodybuilder. He shaved his head and was chosen for some movie roles. "His life was on an even track," Barbara told ABC News. "He had a lovely, lovely girl he was engaged to and they were going to get married in another month." Unfortunately, the drugs associated with bodybuilding were too much for Matthew to resist and he started injecting himself with steroids. On a June day in 2001, he was found slumped over the steering wheel of his truck. Small small amounts of heroin, marijuana, anabolic steroids and a syringe were found in the vehicle. In the 1980s, after her breakup with Charles Fegert, Barbara dated Dr. Stanley Frileck, a Brentwood, California plastic surgeon and a director of the Michael Jackson Burn Center in Culver City, California. Barbara's friend, Michele Lee of Knot's Landing fame, introduced them. In a 1985 article by Richard Sanders for People magazine, Frileck is quoted as saying of Barbara, "You look at her and your think, "This is a blonde with not much there. But she's a very well-read, intelligent and genuinely optimistic person." For over 25 years, Barbara has been married to Jon Eicholtz, an architect and real estate developer. They met on a blind date and Barbara was impressed by his heartland values. She told Kansas City, Kansas' 435 magazine that her friend "initially had dinner with him and vetted him for me,” The couple wed in San Francisco, California on January 5, 1991 and today marks their 26th anniversary. Barbara and Jon currently reside in Beverly Hills. * According to Barbara Eden's official website, she has appeared on more than 50 television variety shows, including 21 Bob Hope specials. 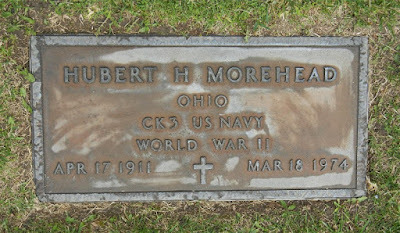 * Barbara biological father, Hubert Henry Moorhead, died in Hawthorne, Los Angeles, California on March 18, 1974. * Barbara has a younger sister named Alison Scanlon. Alison is the daughter of Barbara's mother, Alice, and Alice's second husband, Harrison Connor Huffman. * Barbara's first husband, Michael Ansara, starred in numerous films and took on numerous television roles, including Cochise in the Broken Arrow series (1956-1958). He is probably most known for his role as Kang, the Klingon leader, in a 1968 episode of the original Star Trek television series, "Day of the Dove" (Season 3, Episode 7, Air Date: November 1, 1968), and also in the later science-fiction series Star Trek: Deep Space Nine (1994-1996) and Star Trek: Voyager (1996). 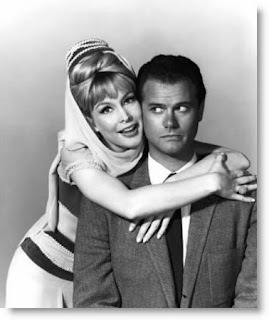 Michael appeared with Barbara in three episodes of I Dream of Jeannie. They are "Happy Anniversary" (Season 2, Episode 1, Air Date: September 12, 1966), "Battle of Waikiki" (Season 3, Episode 15, Air Date: January 2, 1968) and "My Sister, the Home Wrecker" (Season 5, Episode 12, Air Date: December 9, 1969). Ansara wed Beverly Kushida in 1977 and they remained married until his death. * From 1990 to 1991, Barbara Eden had a recurring role on Dallas, alongside her former I Dream of Jeannie co-star Larry Hagman. She played the role of Lee Ann De La Vega. * In October of 1986, Barbara released an autobiography entitled Barbara Eden: My Story. In 2011, she published a memoir called Jeannie Out of the Bottle. 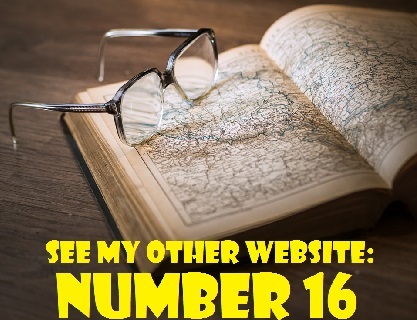 It was released by by Crown Archetype, a division of Random House. * Barbara received a star on the Hollywood Walk of Fame on November 17, 1988. It is located at 7003 Hollywood Boulevard.